The common lilac shrub has long been a staple in both the amateur and professional landscaper’s plant palette. It’s dark green leaves blending with it’s fragrant lavender flowers are a favorite of Spring-time landscapes. Lilac lovers prefer the mutiple-stemmed, large shrub. 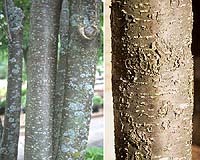 However, there are those that prefer the single stem, ornamental look in their landscapes, and have been steered in the crabapple and hawthorn direction for most of their ornamental tree needs. Often times the Japanese tree lilac (Syringa reticulata) is overlooked as a valuable ornamental tree with many similarities to the shrub-form lilac. Although the most popular cultivars of this species has been in the landscape trade for over 25 years, only recently is it finding its way into our landscapes in a more consistent fashion. The ‘Ivory Silk’ is the most common variety of Japanese tree lilac seen in nurseries around the metro Denver area. 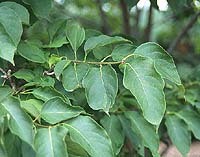 The leaves are similar to the common lilac shrub, dark green and oppositely attached to a shiny brown, stout stem. The Japanese tree lilac is hardy to this area, able to withstand winter temperatures as low as 30 degrees below zero. When it comes to the flowers of the Japanese tree lilac, the similarities end with the common shrub-form lilac. The tree-form has a creamy-white, large flower that bursts to life in early to mid June that can be up to foot long. The Japanese tree lilac often stands out in the landscape in June, boasting its beautifully large flowers after most other ornamental trees have already flowered. The fragrance of the Japanese tree lilac does not match that of the shrub form, but more than makes up for that shortfall in its appearance. The Japanese tree lilac can be planted from a container or as a balled and burlapped specimen. They are adaptable to our high soil pH and prefer full sun. The Colorado Tree Coalition, a non-profit organization that leads efforts to preserve, renew and enhance urban and community forests around the State, recognizes the need to plant the right tree in the right place. The Japanese tree lilac, with its mature height at around 20 feet, can be planted in tighter landscape areas around the house, or as a street tree where overhead power lines greater than 30 feet exist.